The federal government is confident of channelling more vessel repair jobs to Labuan now as the outlook of the oil and gas (O&G) sector in the island has improved. Defence Minister, Datuk Seri Zahid Hamidi, who gave this assurance, said the move was in line with the government's policy of helping the local companies more forward. He said Labuan Shipyard Engineering Sdn Bhd (LSE), one of Asia's largest shipyard involved in vessel repairs and fabrication, has proven its capability to complete the various projects given. "I have given my assurance to send more vessels to LSE with the condition that 30 per cent of the jobs be shared among local companies. "They (local companies) have proven track record and capabilities of handling various jobs under LSE," he told Bernama in an interview here Saturday. Zahid said the channelling of the jobs to local company like LSE was also part of efforts to reduce over-dependence on foreign expertise where the cost of sending vessels abroad for repairs and refurbishment was high. 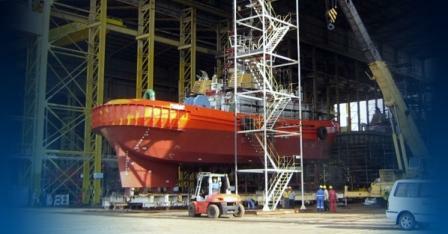 "We are confident with the performance and skills rendered to upgrade and repair our vessels thus far," he said. The minister was here on a two-day visit to LSE to officiate the launch of Hull Block DP2 Diesel - Electric Propulsion Platform Supply Vessel and to Preston Shipyard Sdn Bhd. Meanwhile, LSE chief executive officer, Mohd Azman Nasir, said the company was grateful to the minister for the assurance of jobs. "The company's performance has improved for the last three years on positive assessment from Petronas. "The government jobs will greatly help the company regain its glory of being the regional champion in the ship building, oil and gas as well as fabrication," he said. Mohd Azman said the company recently fabricated and delivered two units of Single-Point Mooring buoys for the Sabah Oil and Gas Terminal and two units of Mid Water Arches for the Cendor oil field development project. "This is a testimony to our company's ability to construct and successfully deliver world class and sophisticated truly Made-in-Malaysia products to our many satisfied clients," he said. He said LSE was also confident of undertaking major refits and modification works besides the normal routine and emergency repairs and to construct new-generation patrol or multi-role support vessels for the Royal Malaysian Navy.